Five days until Earth Day 2012. This is the time of year to re-evaluate what you are doing to help the enviroment. I have always said it starts small. Recycle, use reusable shopping bags, or compost. What about your purse? What about one made from rice sacks? BuyGreen.com is your one stop shop for all of your eco-friendly products. They have everything from building materials to bath towels. There are so many items on their site that I could go on forever. BuyGreen.com was created from their search for eco-friendly products. They were looking to live healthier and help the plant. Their mission is to be the number one trusted source for green products. I was thrilled to get the opportunity to review one of their eco-friendly bags. The Rebagz Life Is A Circle bags are different than anything I have ever had. Who would have thought rice sacks could be turned into a purse. I love sporting this bag. It draws the attention of EVERYONE! The Rebagz come in six different designs. I received the Jasmine Life. It's a bright yellow and a very pretty jasmine pattern on the front. 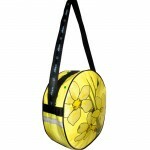 Great purse for summer and if anything spills on it, the easy wipe surface is great. You also don't see too many purses that are completely round. Take a look. Mother's Day is coming up in a few weeks and this would be a perfect gift for your Mom. Young or old I thank any generation of woman would love this bag. Don't forget to check out the other items Buy Green has to offer. I would especially check out the bedroom & bath section. They have some bamboo robes I would kill to try! I found it from Mimi Loves All 8 Blog. I found this awesome giveaway from Giveaway promote blog! I found out through giveaway promote. Via e-mail newsletter. Thanks for the giveaway! I found out about this from Giveaway Promote via email. I found this giveaway at Purse Pixie. Cruising around your site after I read your newsletter! I found you through Purse Pixie. I love eco-friendly bags and don't really like carrying or wearing leather. These a great!